LiquidNet Review 2019: Is LiquidNet a Good Hosting? LiquidNet Ltd Hosting offers website hosting solutions that are a combination of excellent support, an array of features, and affordability. The U.K.-based company is most popular for its robust yet fairly-priced shared website hosting solutions, and top-notch data centers located in a number of countries. Established in London in 2003, Liquid Ltd Hosting is one of the most preferred web hosting companies in the United Kingdom, Australia, and the United States. The company offers shared hosting solutions, dedicated and VPS hosting, as well as domain registration services. It has data centers in five other countries, including the U.K., the U.S., Australia, Finland, and Bulgaria. This ensures that every site they host receives 99.9% uptime guarantee. The company provides hosting for websites across the globe and is available in English, French Spanish, and Portuguese. With over 100,000 resellers in its ResellersPanel program, Liquid Ltd Hosting continues to lead the way in the web hosting services space for websites of all types and sizes. Browsable daily backups – make it extremely easy to restore lost website content. It also gives you the option to do manual backups with a simple click of a button on its Control Panel File Manager. 800+ free themes – these unique themes are available with the vendor’s cloud hosting solutions and cover an array of topics and styles including online shops, personal blogs, and business websites. Intuitive control panel – allows you to manage every facet of your presence on the web without the need to use other tools for domain management or billing making it a superior, all-embracing website administration tool. Liquid Ltd Hosting offers numerous free bonus features including a Web App Installer tool, a Sitemap Generator, an Easy Website Installer, and an .htaccess Generator. All its cloud web hosting plans include free domain transfer or registration. Using LiquidNet Ltd Hosting services is quite easy and their technical team will be there to help you with any issues you encounter. What’s more, you have the option to choose your data center without changing the price of your hosting plan. This makes Liquid Ltd Hosting one of the most affordable hosting providers on the market. The ease with which you can move from one hosting plan to another is noteworthy. With a simple click of the button, you can upgrade your purchase plan and unlock all restricted features. LiquidNet Ltd Hosting has some notable limitations when it comes to customer support. The company has not included a live chat on its website, a support feature that is increasingly becoming an industry standard for web hosting vendors. They also do not have a support email where you can send your queries and questions. However, what the website lacks in those two areas it compensates with a straightforward contact form that their tech team checks 24/7. Additionally, LiquidNet Ltd has provided four different support team phone numbers that you can call including a toll-free U.S. number, an international phone number, a U.K. phone number, and an Australian phone number. We called their US toll free phone number and they responded almost immediately and gave extremely helpful information regarding their services. LiquidNet Ltd Hosting is the choice shared hosting provider for people looking for excellent hosting at affordable prices. It is the perfect option for cheap but effective shared and cloud hosting solutions. 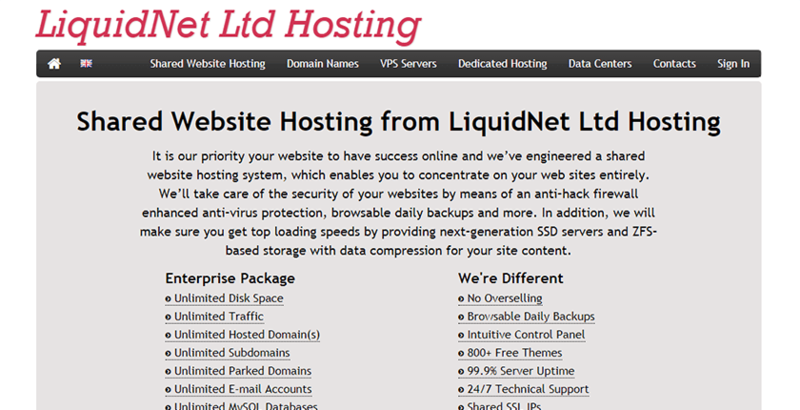 Wondering how LiquidNet stacks up against other Web Hosting companies? Enter any other Web Hosting company and we will give you a side-by-side comparison.